07-Nov-2015 -- As I had just completed several days of promoting Geographic Information Systems (GIS) in education and society at the combined conference of the Applied Geography Specialty Group and the Southwest Division of the American Association of Geographers (AAG), a confluence visit seemed like an appropriate way to end the week. In the early afternoon I found myself at 31 North 94 West. I was now on my way back to Houston and seeing that this conference was only a short detour from my intended route back to the city, I just decided to make a run for it. Short detour of course is all relative to a geographer. The rain has been falling for at least 24 hours and everything was thoroughly soaked including me from my hour and 35 minutes out in the Texas sized deluge to the previous point. So, I figured a little more rain on the clothing would not matter in the least. At Woodville I drove northwest along US Highway 287 to Corrigan, and then west along the same road. I then turned off of the highway on a dirt road, County Line Road, into the forest. It was very muddy and slippery. Having experienced a very wet dirt road a few hours before, I was a little nervous about getting stuck but I forged on. After about 10 minutes, I saw the powerline right-of-way that I'd seen in the previous narratives. I parked at the rutted trail leading north, but then, seeing a truck about 40 meters north of me, and realizing that I was blocking the trail, moved the vehicle. Once back inside, I hastily made a confluence sign. Exiting the vehicle, I made great haste, owing to the rain and the lateness of the day. I had about 40 minutes left of good daylight. I was only five minutes walk from the vehicle when I saw a tall hunters tower ahead of me. A man was walking toward me after descending the tower. He was not happy, shrugging his shoulders indicating a "why in the world are you here bothering me?" look. Knowing that I was indeed bothering him by thrashing around in the brush, disturbing whatever wildlife he was trying to shoot (and also realizing that he was of course armed), I explained myself as quickly and in as friendly a tone as possible, indicating that I would only be there for five minutes. I didn't wait for his approval. Fortunately, the confluence was a little bit out to the east from where he was stationed. The confluence was a bit difficult to actually stand on the point because it was right next to an enormous pile of lumber and leaves. For indeed, the entire area was radically altered from the last time a visitor had been to the spot. 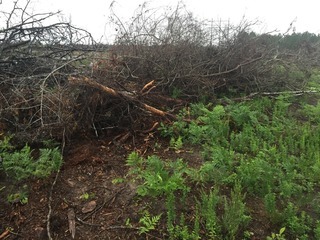 Instead of just a powerline right-of-way that had been cleared, much of the area had been deforested, and recently. It was a complete mess. I felt a bit melancholy with the state of the landscape. It would be interesting to come back here again some day to see what the final land-use would be. Would new saplings be planted in a tree farm? Or would this be overrun by houses? These were the thoughts that occupied my mind as I wandered to get the unit zeroed out. But for obvious reasons with the hunter to the west of me, I didn't stay more than a few minutes. Plus, it was still raining outside. I had stood on this line of latitude a few times before, from Texas on the west to Alabama on the east. I also had stood on this line of longitude several times from Iowa on the north to Texas on the south--far north of here in northeast Texas, two years ago. I now have a very nice collection of at least 13, I estimate, points in Texas ranging from the Llano Estacado in the Northwest part of the state to these two points in the southeast side of the state. I also have visited a point offshore but I visited on a boat in the Gulf of Mexico once. And a very lonely cactus walk in the far south part of the state as well. Despite the difficulties in reaching this one, I was going to sad to leave. But, given the hunter to the west and the rain, I wasn't here long and quickly trudged through the mud back to the vehicle. For obvious reasons I didn't read assemble my materials right at the vehicle, not wanting another encounter with the man, but I drove down the road toward the main paved road. Once there I took about 20 minutes to change into some different clothing that I had with me from my business trip. It was dry and it was amazing how much better I now felt. My shoes were wet but now at least I was a lot more comfortable. I then drove east to Corrigan, And then southwest to Houston where I had a meeting with my colleagues at Applied Field Data Systems. It was good that I changed clothing for this meeting, not wanting to show up at a meeting looking disheveled. Of course, they run a field equipment and GPS business, so they are very used to people being out in the field! It was a great day and despite the weather I'm glad I made these two confluence point runs. #1: View of 31 North 95 West, in the foreground, looking northwest. #2: GPS reading at the confluence site. #3: Joseph Kerski at the confluence site. #4: Ground cover at the confluence site. #9: 360-degree video with sound filmed at the confluence site (MPG format).